The policy paper is part of the government’s review of its relationship with Ireland’s scattered sons and daughters. It has been in the works since Deenihan, a Fine Gael TD from north Kerry, was appointed to the new ministerial post in July and is based on interviews with individuals and submissions from Irish organizations from around the world. Kerry T.D. 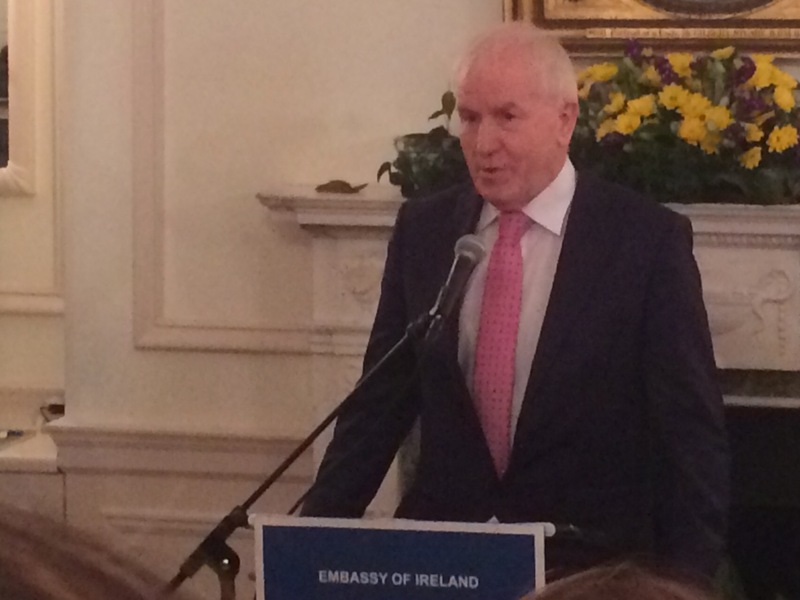 Jimmy Deenihan at the Embassy of Ireland in Washington on Jan. 22. Deenihan noted how the Irish diaspora maintained a strong relationship with the homeland through the 18th, 19th and 20th centuries. But new measures are needed to meet the challenges of the 21st century, especially engaging the younger generation of Irish emigrants, he said. The global Irish diaspora is estimated at 70 million people, including about half in the U.S. Some 156,000 people born in the Republic of Ireland were living in America at the start of the 21st century, with an estimated 50,000 Irish currently living in the country illegally. Deenihan told The Irish Times he doesn’t think the new Republican majority in Congress can stop President Obama from sparing four million illegal immigrants of various nationalities from deportation. He said undocumented Irish should start preparing the paperwork required for temporary relief from deportation under Obama’s executive order. Deenihan was less specific about immigrant issues in his talk at the Embassy. He mentioned meeting with Congressman Paul Ryan, Republican of Wisconsin, and other members of the new majority “because they are the ones in power.” But he suggested Republicans “will work together” with Congressional Democrats on Ireland’s behalf. As for the forthcoming policy paper and improving relations with the diaspora, Deenihan said groups such as Irish Network-DC and 18 other chapters under the umbrella Irish Network USA organization are critical. He also said his office would begin reaching out to alumni of Irish universities, regardless of where they were born, who can help Ireland with economic development and other opportunities. Tech companies working in Ireland such as LinkedIn, Twitter, Facebook and Google are also being asked to help build connections. “That should suit the Irish diaspora quite well because we are spread so wide,” Deenihan said. Deenihan announced that he will open a major exhibit at the Art Institute of Chicago. “Ireland: Crossroads of Art and Design, 1690 – 1840” will feature more than 300 objects from public and private collections. An exhibition of 18th century decorative and fine arts from Ireland has never been undertaken on either side of the Atlantic, according to AIC. The exhibit opens on St. Patrick’s Day and continues through June 7. This entry was posted in Arts & Culture, Business & Environment, Irish America, Politics and tagged Art Institute of Chicago, Irish Network, Jimmy Deenihan, kerry, Paul Ryan on January 23, 2015 by admin.